With three routes including a 10km for kiddies and funsters, a 40K family cycle and the 90km Cliona’s Foundation Challenge the organisers have appealed to cyclists with all levels of ability. This year the cycling club are appealing to families to join them on their new 40km route which is aimed at families and leisure cyclists. Following the cycle there’s a BBQ, face painting, music and a bouncy castle to keep the entire family entertained. The Foundation would also like to say a big thank you to Halfords in Limerick who will be providing a free bike check to everybody participating in the cycle on the day. To take part in this year’s cycle you can register on line by logging onto www.eventmaster.ie or on the day with registration starting at 8.30am in the Honeyfitz Theatre. Entry is €25 for the Experienced Cycles and €30 per family for the 40K Family Cycle and 10K Kiddies cycle. Entry fee includes, BBQ and entertainment on the day. 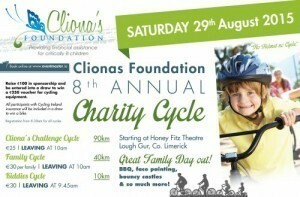 Sponsorship cards are available by contacting Cliona’s Foundation on 061-331333. Sponsorship Cards with €100 or more raised will be included in a draw for a €250 cycling voucher.